James Walden Lawton lived in Wisconsin in the 1890s, having been born there in 1860. Prior to that he had married Sarah Saubert in 1883, and a son, Alvia Ray Lawton, was born unto them in 1884. Alvia was always known as Ray, and during the 1960s he wrote a short history of the Lawton family as he knew it. It was during the Spanish-American War placing the event about 1898. The Chicago, Milwaukee and St. Paul Railroad was drilling a tunnel through a small mountain near the Lawton home. A representative of the railroad asked the Lawtons to house a work crew for the length of time required for the project. The horse barn loft was converted into a bunkhouse of sorts for about twenty men, while the Superintendent named Smith, his time keeper a Swede named Lundgren, the foreman, and the powder monkey (dynamite man) slept in the Lawton home. 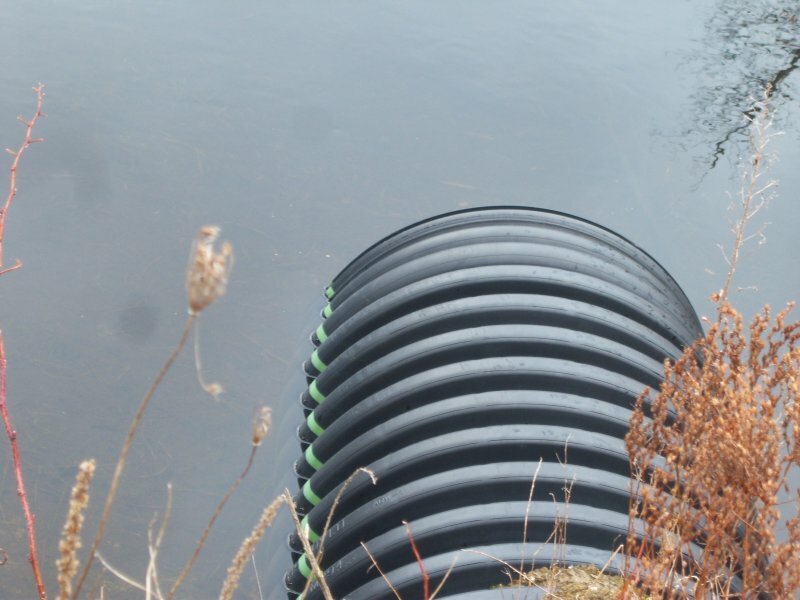 It seems that Smith, as well as James Lawton, were always up for a good practical joke. One night Smith said, “Lawton, I think we ought to go out and hook a melon, if you know where there are any.” James said, “Sure, my cousin has a dandy patch down the road about a mile.” After the evening chores were done, James, Smith, the hired man, and Ray struck out for Jim Paul’s melon patch. It was dark when they began thumping melons in the patch immediately outside Jim’s back door. All of them knew how to thump a melon with the middle finger to determine their ripeness. Right in the middle of their search for a nice ripe melon the house back door opened and Jim Paul and another man named Jim Deaver, one of the biggest, most powerful men in the entire valley came out. Someone hissed “down” and all of the intruders flattened into the vines and weeds. That’s one time that weeds were welcome in a melon patch. The two Jims went around thumping melons in a search for a ripe one for their own use. They found one that was suitable, went back in and closed the door. Wednesday, April 27th was the warmest day of the year in this area. This may have been instrumental in bird activity. Our feeders were kept busy with take-out calls. 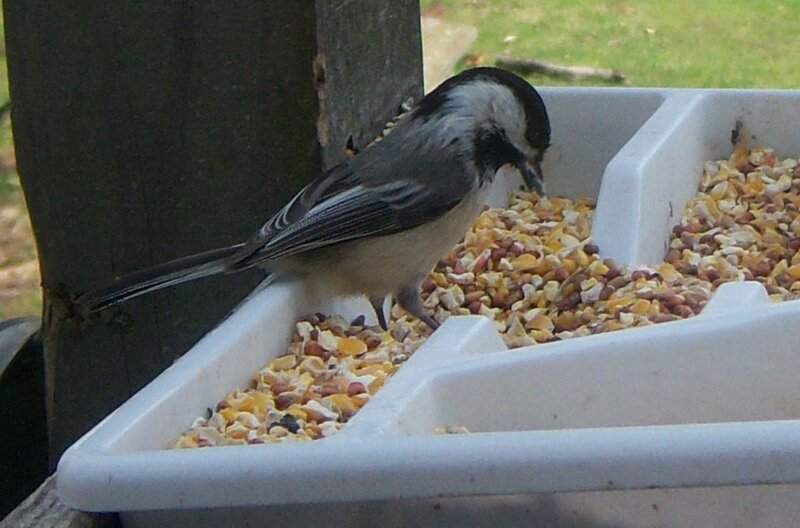 First there was a Black-Capped Chickadee sampling the mixture of stuff in the old silverware tray. 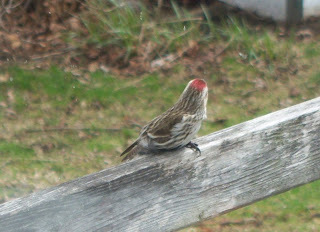 He seemed to like it well enough to sit there while I snapped a couple of photos. 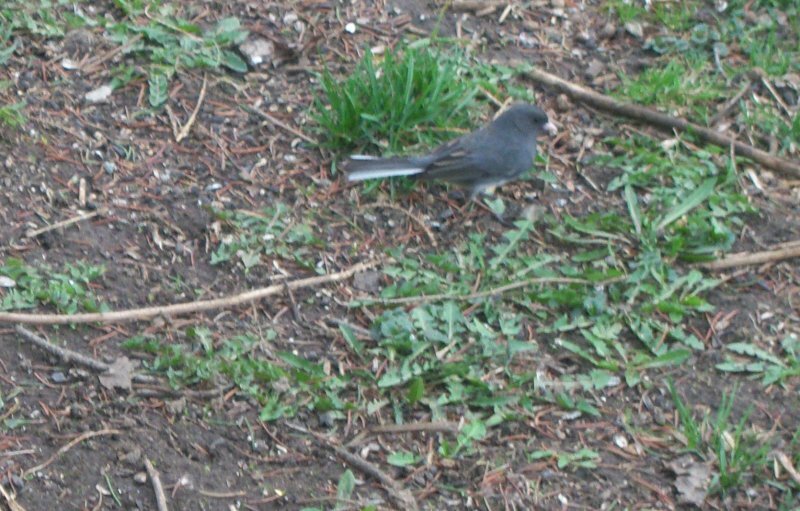 Next I glanced down at the ground behind where I was sitting on the porch to spy a Dark-Eyed Junco gleaning the spillage from the tray feeder. 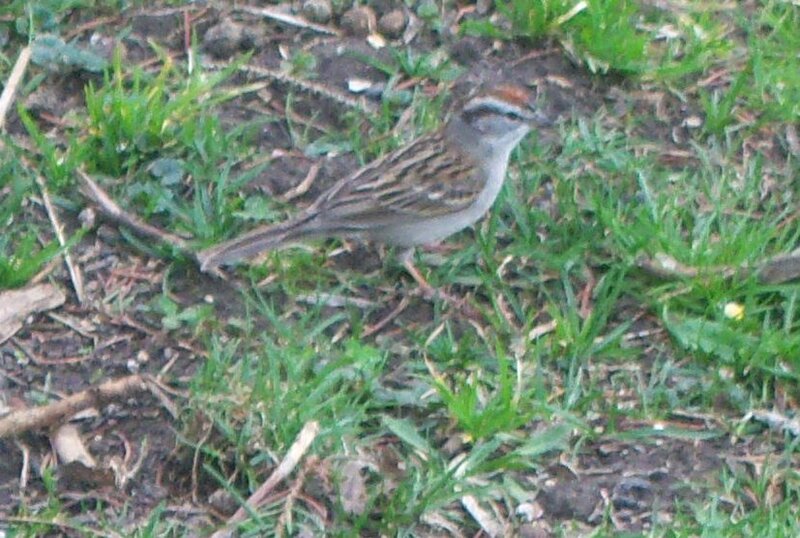 Only a minute or two later a small Chipping Sparrow flew in to check what the daily offering might be. 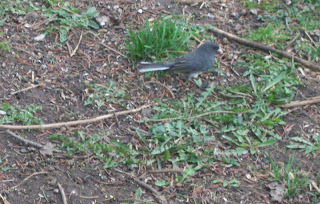 Like the Junco he preferred to search the ground. 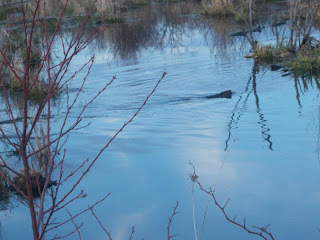 Later in the day I roamed back to the Beaver Pond. I noted the water level is slowly rising. The green line has gone underwater at the outer end now, maybe an inch higher than I previously noted. I then found a Raccoon but he was not having any part of sitting still for a photo op. I snapped three photos of it running, but none are any good. 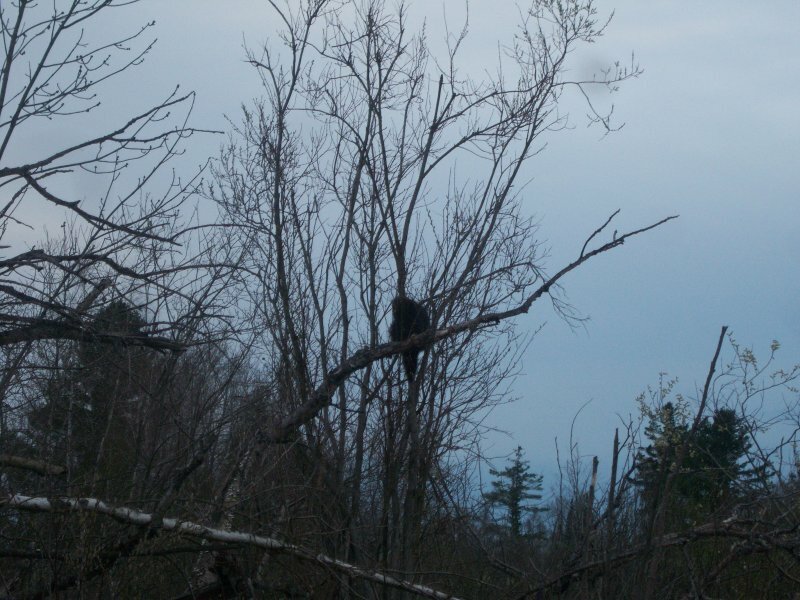 I continued on my way and next spotted a Porcupine in a small tree. Darkness was approaching so a silhouette was the best I could do. 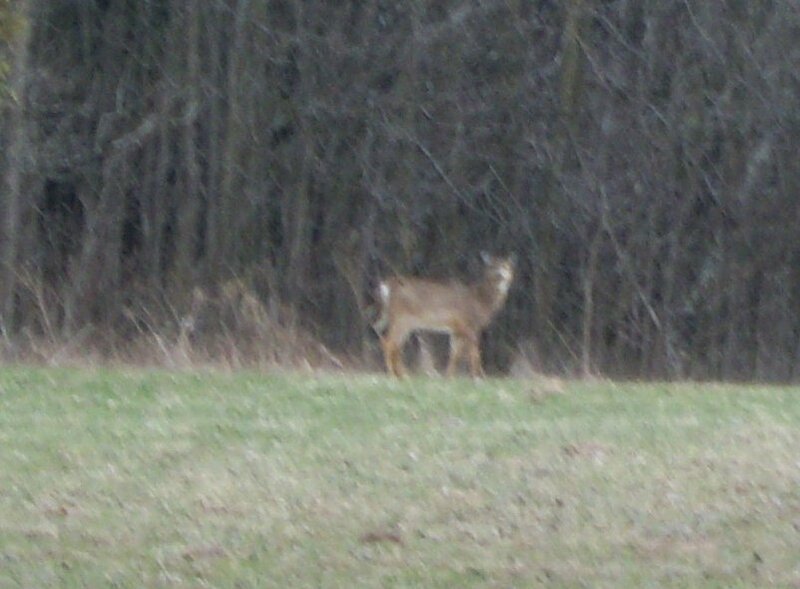 It was in the background tree, with its back to the camera, not on the dead limb. 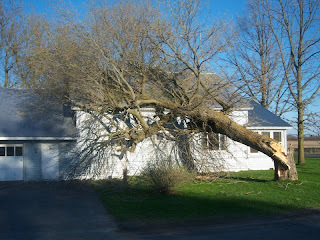 Thursday, the 28th, dawned as a really windy day. 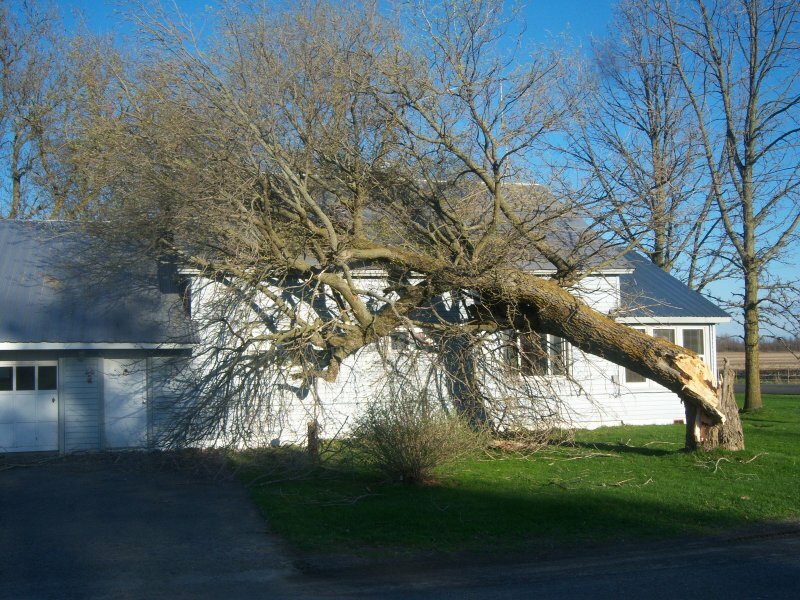 We have had gusts up to 65 or 70 MPH throughout the day. 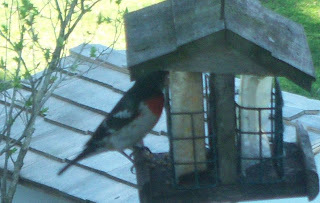 I don’t know if that aided or hindered the male Rose-Breasted Grosbeak traveling to our area, but at any rate it is the first we’ve seen this year. This evening my son-in-law reported a tree was on the roof of a small home a mile or so from here. I have a nostalgic feeling for that modest home as it was the one-room-school that I entered in 1942, and last attended in 1948, at the completion of my sixth grade. Usage was ceased for it in the mid 1950s, and it was sold to an individual while I was in the U. S. Navy. The remaining two photos show that no great harm has come to this former center of Readin’, Ritin’, and ‘Rithmatic. 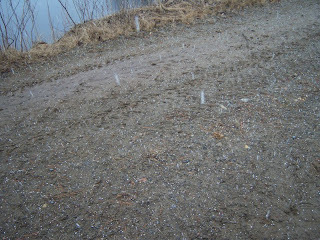 It was a little after 6 pm, warm enough at about 60, but with a slight rain. I made my usual observatory trip through wood and meadow to see what I could see. While sitting quietly at the pond I noted a muskrat slowly swimming toward me. Apparently not noting my presence, it left the water and climbed the bank to the roadway where upon seeing me it paused to decide what to do. I got a quick photo for those who may never have seen one rather close up. They resemble an ordinary barn rat rather closely. 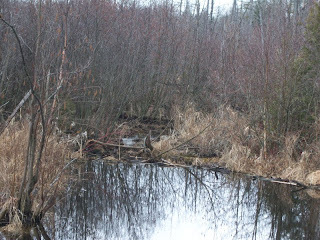 I next observed that there was a cedar bough in the water right outside where I know the bank den entrance to be. It may be food, or den building material, or both for all I know, but I’m reasonably sure it will go into the den soon. Notice those sprinkles in the water. I even get wet to take these photos. After leaving the pond I took a bit of a circuitous route back toward home. 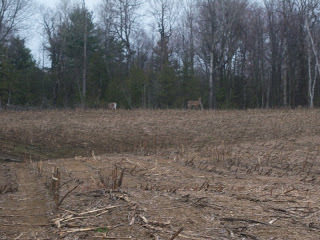 On my way I wandered into a pair of deer. 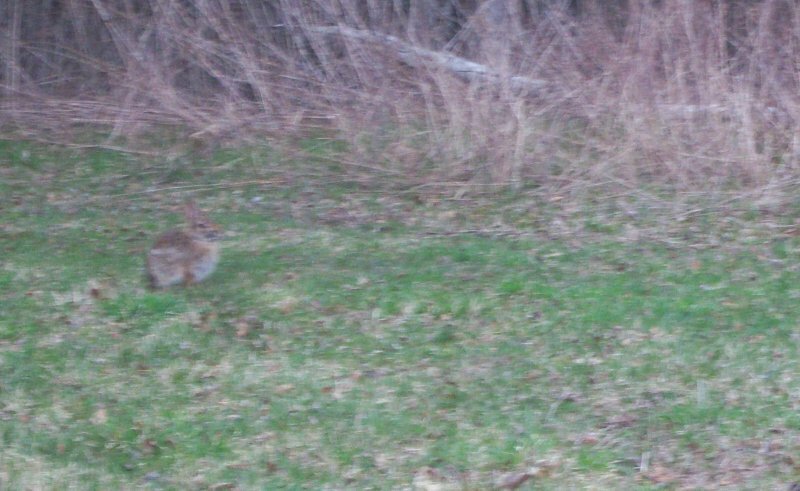 The one on the right was some larger, and I assume the mother of the yearling fawn on the left. 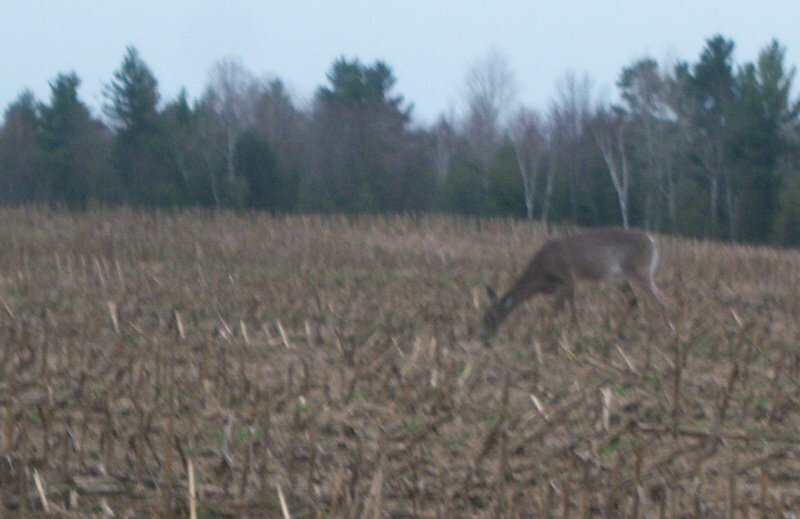 This is the fawn calmly eating some tender young morsels possibly a hundred feet away from me. Later it got nervous and headed in the direction the larger one had gone in previously. 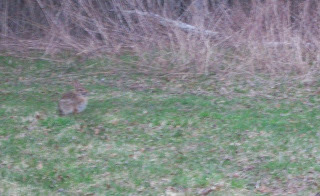 Five minutes later, back on my own property I spied the after Easter Bunny. 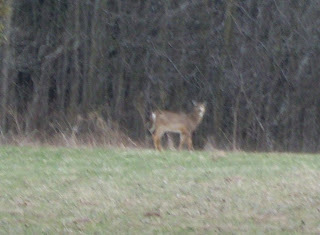 He waited and watched for a few minutes until he thought I got too close, and then he darted away into the underbrush. 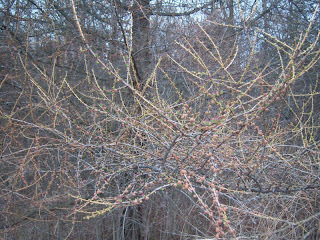 Next I noted that the tamarack tree that I photographed earlier in the year was beginning to show its spring finery. 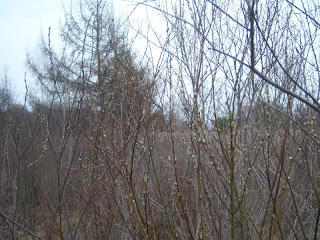 You can note the little green leaves beginning to pop from their buds among the tiny seed cones. A little further along the way I stopped at a willow bush where the tiny catkins are turning to green which eventually will be leaves. I’m sure this is the beginning of a new year, not January 1, as we are led to believe. Let’s see how well you can follow this? My wife’s sister, Karen, married Ronnie. Ronnie and Karen’s son, Noel, married Mindy, my brother’s granddaughter. Noel and Mindy have a daughter Emma. Through Mindy, Emma is my great grandniece. I’ve no idea what relation she is to me through Karen. 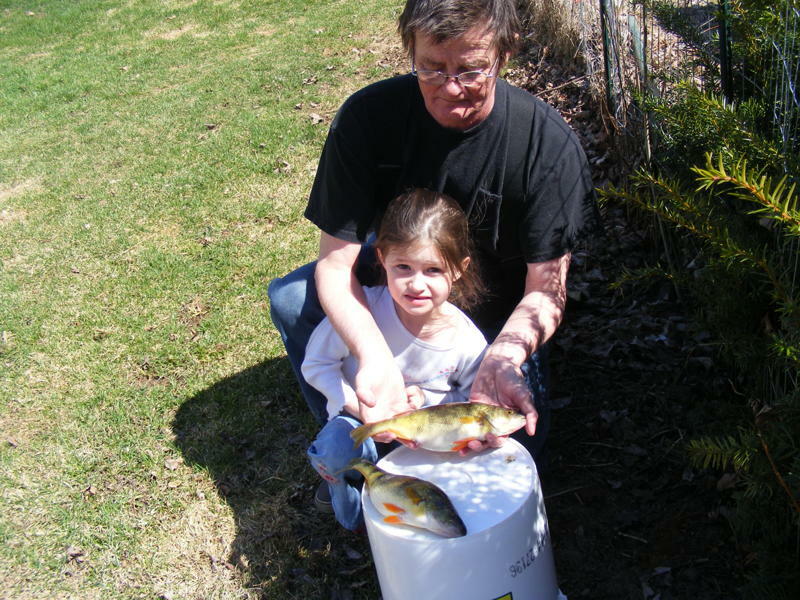 No matter, Ronnie and Karen took Emma fishing and these two specimens are the result. The two fish are perch. 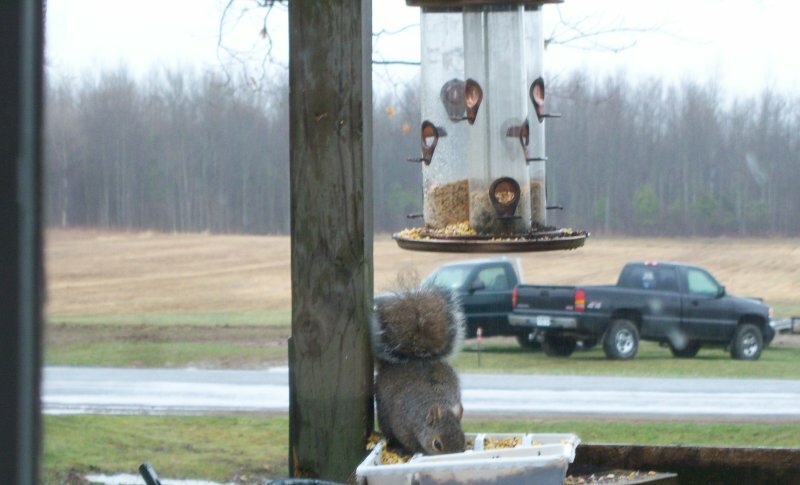 The two specimens are Ronnie and Emma. That’s the end to that story. About the same time the fishing trip was taking place I learned where a wild turkey was nesting. 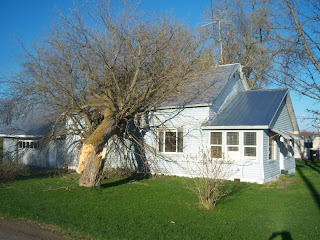 My brother, Lawrence, trimmed a tree on his lawn. 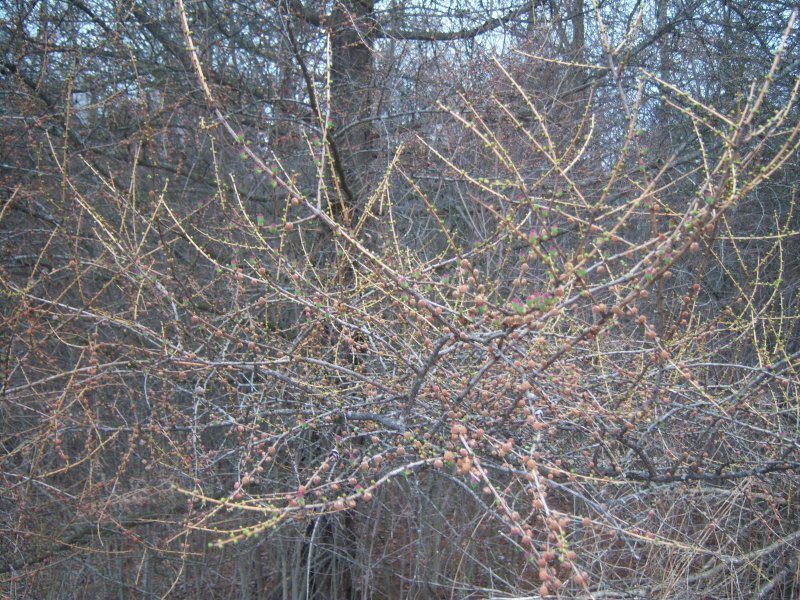 He then carried the limbs to a woody/swampy area on his property. 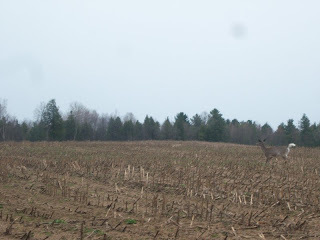 Just as he tossed the limbs on a brush pile a turkey erupted from same. It like to scared him half to death. At any rate he immediately told me so I could photograph it at will. I decided to wait a day or two before venturing near it again so I don’t spook the poor hen turkey too badly. More later. 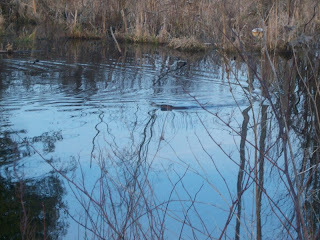 Later this evening Alex and I wandered back to the Beaver Pond as we do nearly daily. 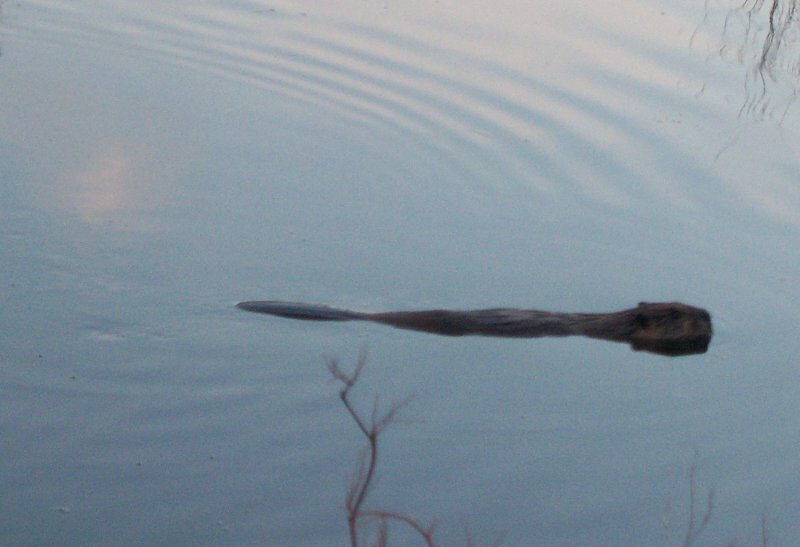 Our friend, Bucky, was having an evening swim, and decided to show off for us. First he did a wonderful counterclockwise spin for us. Showing us that this beautiful arcing turn was not a fluke, he followed it up with another. Just to prove he was not a one-trick beaver he continued on with a clockwise maneuver which he was just as adept at as the other direction. At the end he swam a bit closer as he awaited his due applause. It was during the early winter in late 1957. I was stationed aboard the U. S. Naval Air Station at Quonset Point, Rhode Island. One Friday afternoon I decided to visit my parents in northern New York for the weekend. I started my 1949 Studebaker Land Cruiser and headed west and north. At Sturbridge, Massachusetts I entered the under-construction Massachusetts Turnpike. Heading westward I moved steadily along until I came to Stockbridge, Massachusetts, near the New York border. That was the end of the Turnpike at that time. The next forty miles of mostly dirt road was under consruction to the point where it attached to the recently completed New York Thruway. Once I had entered the Thruway it was smooth sailing all the way to Utica, but a snow storm had been getting increasingly more substantial as I continued westward. By the time I got to the New York Route 12 exit at Utica where I had intended to head north toward Watertown, it was snowing and blowing pretty good. I, knowing there was an area between Utica and Watertown that collects more snow than most anywhere else in the state, opted to go on to Syracuse instead of northward. Instead of going home I decided to visit my brother Bob, in Syracuse, for the weekend. 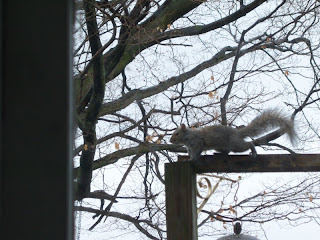 An hour or so later I was drinking coffee at his home. Bob lived in Syracuse where he worked at the Seven-Up soft-drink bottling plant. As the head mechanic for the plant, a part of Bob’s work consisted of greasing and oiling all of the machinery in the plant on Saturdays while the plant was shut down. For lack of anything better to do, I went in to the plant with him that Saturday morning. While there a salesman gave me a small present, a pair of dice with the Seven-Up logo painted on them. They were green, but clear enough to see through, like a Seven-Up bottle. Sunday was a bright and beautiful day, and during the afternoon I once more headed my car out onto the Thruway, but this time headed eastward. A few hours later I was back in my quarters in Rhode Island. 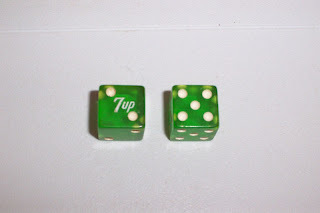 That evening while in a recreation room with a few other guys I pulled the dice from my pocket and tossed them on a table where they came up seven. Several more times I tossed the dice, each time coming up seven. At some point one of the guys picked them up to study them to see if he could see why they always seemed to come up seven. Although he could see right through them, they appeared completely normal so he gave up. A few more of the guys also picked them up and looked them all over, but none could discover why they always came up seven. All knew that somehow they were loaded, but no one could tell how it was done. I kept those dice for quite some time before I lost them one night, and never did anyone discover that one die had nothing but fives on it, while the other was nothing but twos. It was only possible for them to come up seven, a very nice advertisement for SEVEN-UP soft drink. Saturday, April 16th, a small bird joined the goldfinches squabbling over first rights of eating the delectable thistle seeds from the mesh sock hanging on our porch rail. 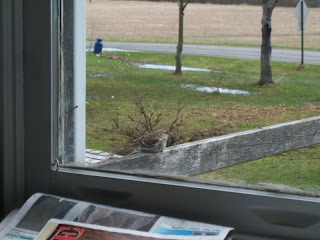 The littler bird seemed at a disadvantage in some manner, but I had to watch a while to understand the situation. This is the little guy taken today. 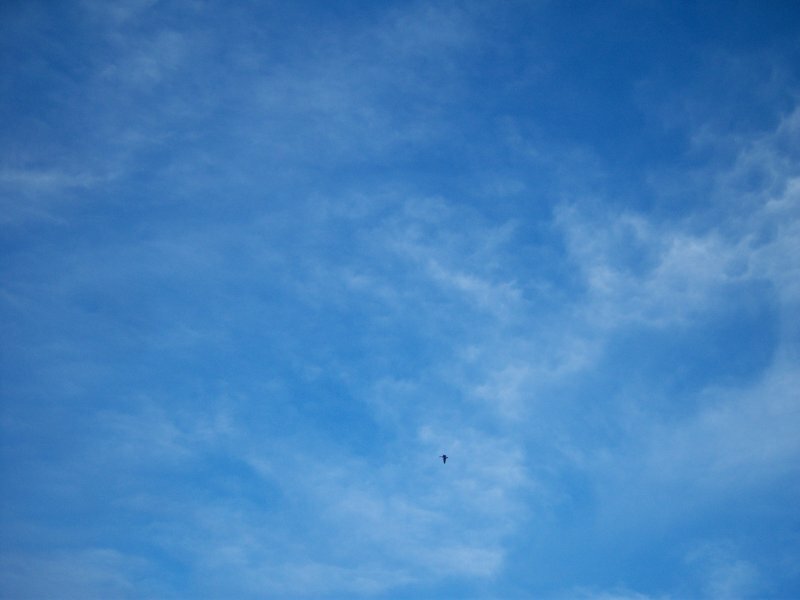 It seemed it sort of never stopped flying. It would cling to the sock, but at the same time would continue to flutter its wings rather than merely perch and eat. After watching it for a while it could be noted that one leg wasn’t functioning properly. 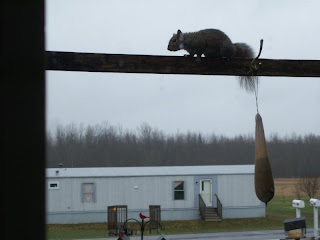 The littlest bird on the feeder clung to the sock with but one tiny foot, and had to continuously flutter the opposite wing to maintain balance in order to eat. In the meantime the larger goldfinches harassed it in an attempt to drive it away. In this second view you can see that only one little foot is in sight. Yet the small bird valiantly held on for dear life as he wrestled the tiny seeds from their repository. I continued to watch fascinated at its tenacity, but I mused that if I were hungry enough I too might learn to be tenacious. 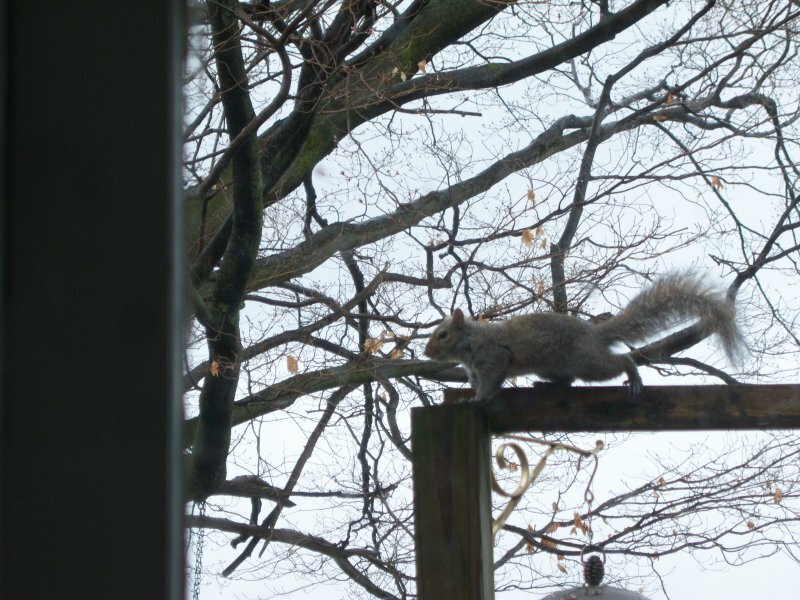 As I studied its actions I caught glimpses of its non-functioning leg. 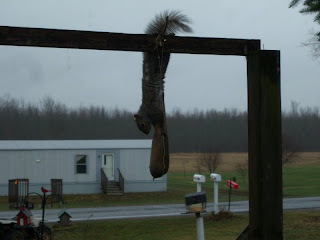 It was hanging rearward with the toes all curled up, and apparently totally useless for its normal purposes. 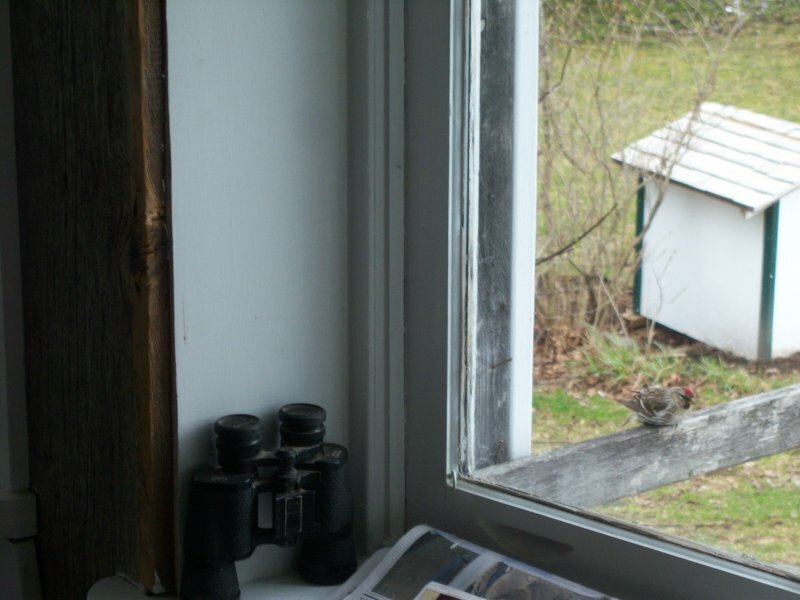 Yet the tiny bird clung to the sock in spite of attacks by the goldfinches, eating the small seeds until it could take no more, and flew to the safety of a nearby tree. 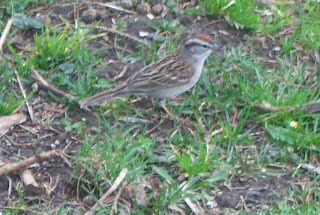 Again only one foot, but you can see the red head presumably giving it its name. Today, Sunday, it returned, still hungry, still feisty enough to obtain some nourishment before being driven away by the larger goldfinches. Finally tiring, it perched for a rest on a porch rail where I was able to snap some photos of it. With the photos in hand, I was able to search through some bird identification books, but I had some difficulty determining what it was. 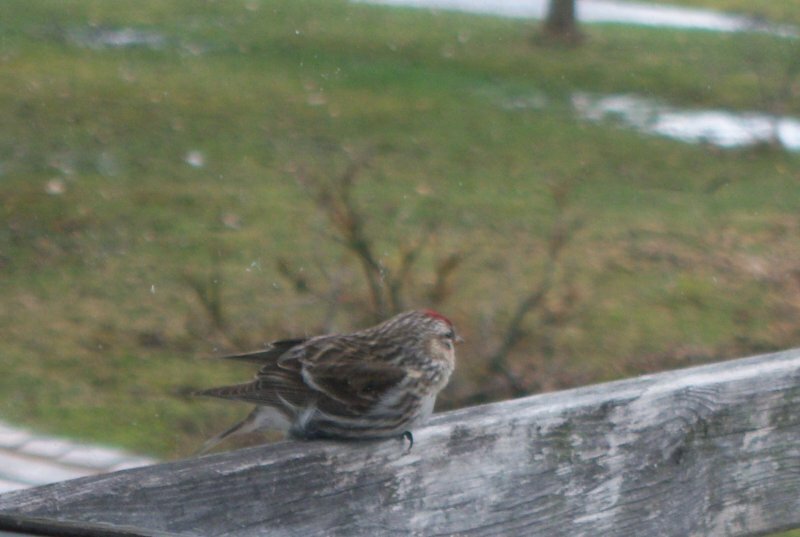 I checked for various kinds of sparrows and finches, which I thought it to be one or the other, with no success. Finally, in the third book, I located a photo of a Common Redpoll that appeared to be a close facsimile of the brave little cripple. Onward to Google, the great-know-it-all, to find any number of images that proved it to be a female Common Redpoll. One more view of the little gal. Did you note the milk station can in the background? 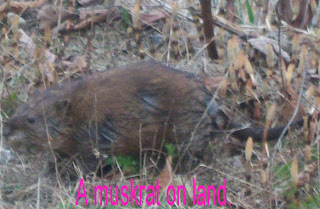 Never before, to the best of my recollection, have I spotted one of this species, but I have now, and maybe the bravest one in the county, if not the state. Look at that, there’s a thingy full of food, but how do I get into it. There doesn’t seem to be any sort of doorway. Maybe this hangy-downy thingy here is easier to collect some goodies from. It looks like one of them humans dirty socks, but it smells better. Getting anything worth eating from that wasn’t all that great of an idea either. All that was in it was some thistle seeds, and they’re so small it’d take thousands of them to get a mouthful. I’m going back the way I came from. It can’t be much worse than trying to get stuff from a wet sock. I hope I don’t fall off of this thing. It’s sort of slippery when wet like this. I’ve made it back to point A okay. I’m going to try to go to a lower level and see what’s down that way that might be edible. Okay, now I’ve found something I can wrap my mouth around. This is more like it. An entire open container of corn and sunflower seeds mixed with other stuff. I think I’ll stuff my cheeks with this stuff and take it back home. 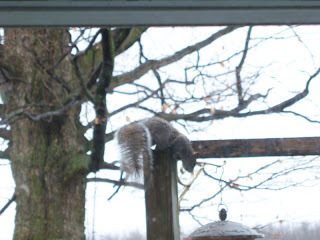 Maybe later today I’ll chow down on it while I sit in my home and watch out the entrance hole as the world passes by. I may make another trip tomorrow. I was sitting on my ATV on the roadway at the pond awaiting something to happen when I realized it was happening all around me, and I wasn’t really watching as closely as I maybe should have been. While I watched for the appearance of a beaver, muskrat, goose, or other creature, I was noticing other parts of nature, but not really letting them register on my senses. 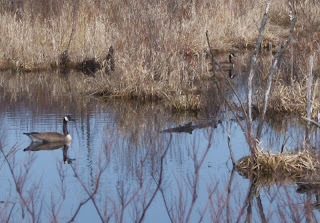 In the far distance, somewhere, I could hear the lonesome call of the yet migrating geese, but I’ve become so accustomed to it in recent days, I wasn’t really hearing it. When I took notice and began using my limited hearing, I also could hear the breeze sighing through the needles of a big pine a hundred feet away. 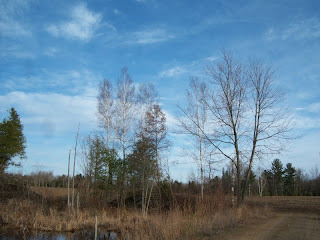 While looking at the pine, which is what one does while listening to it, I noted that the birches not too far away were budding, and would soon have their summer finery ready to show all who might care to see. 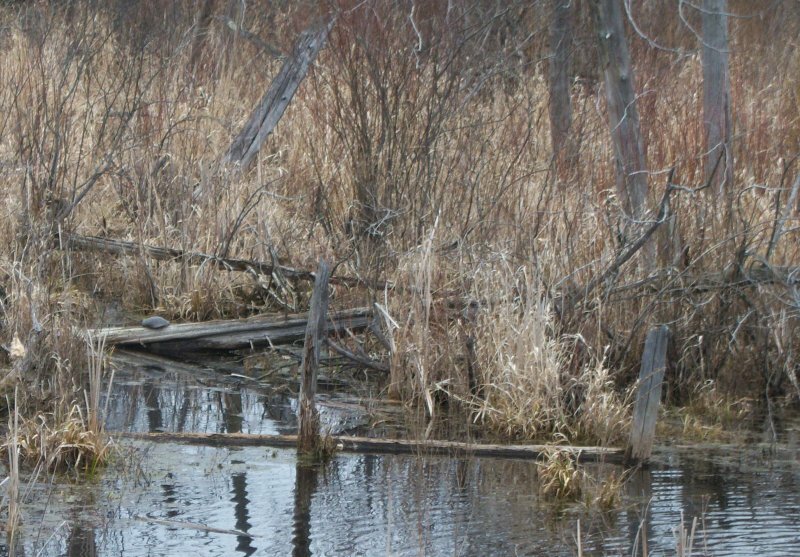 Scanning the pond once more, I noted a turtle sunning on an old log sticking up out of the water. 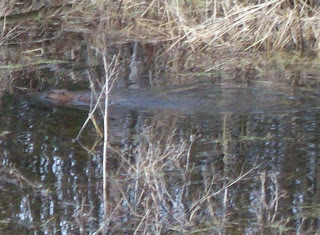 It’s the first I’ve seen this year, and it must have recently arose from its long winter hibernation in the mud bottom of the pond. While spying on the torpid turtle I half heard but half sensed that the tiny peeper frogs were sounding off as a background beat to the activity surrounding me that I was overlooking in my quest for the other species. 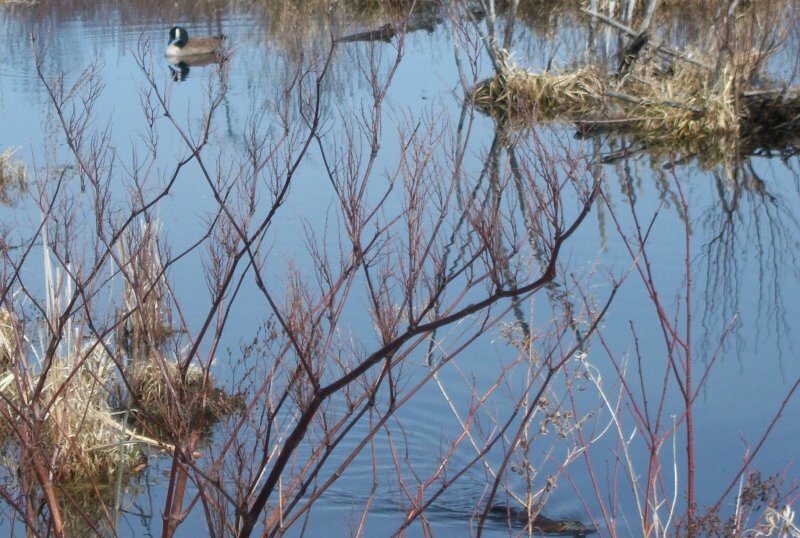 Shortly a pair of ducks, squawking their disapproval of my presence, arose from a hidden nook in the pond, and with that I left for the warmth of my home serene in the knowledge I had paid a little more attention to detail than I had on other occasions. They fly the great eastern flyway as if it were their own personal interstate, and it is. Often in late March and early April there are huge flocks of them numbering in the hundreds returning from their wintering grounds in Chesapeake Bay and other areas. The primeval urge to once again nest and raise a flock of goslings ever drives them onward until they reach their goal of returning to their place of hatching. 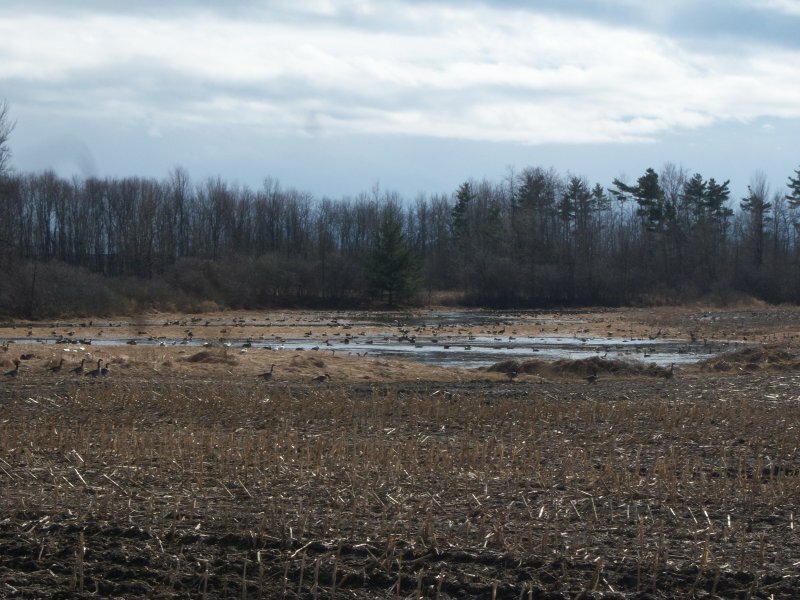 At times the flocks are smaller such as the two flocks in this photo. or even a single goose wending its way across an unmarked path known only to itself. 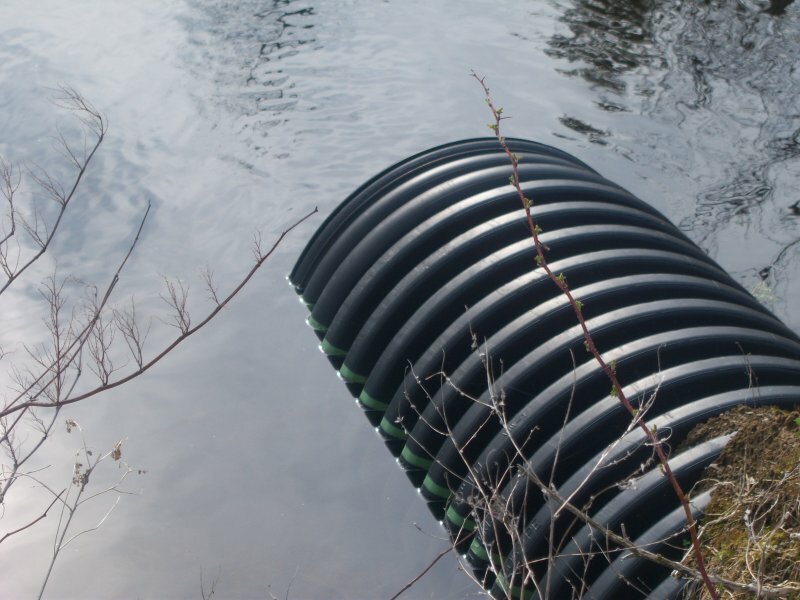 It swings into a landing pattern and alights in a small body of water. 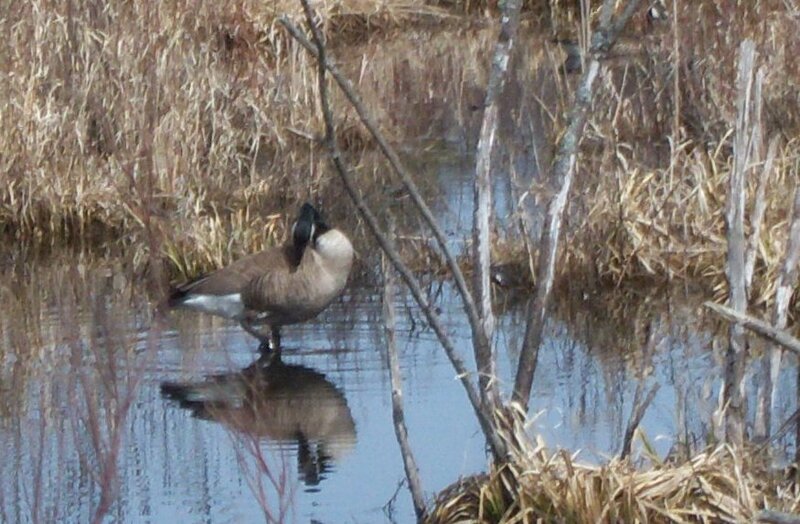 Finally the lone goose settles in for a bit of rest and preening of a misplaced feather or two. 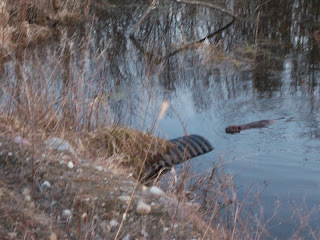 It rests on a half submerged log in a beaver pond at the end of its journey. 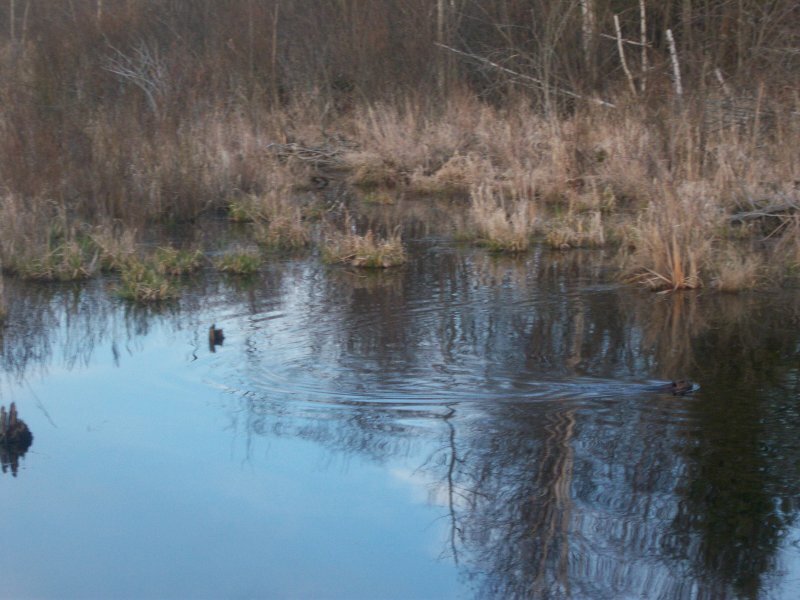 The log was completely floating before the goose stepped onto it, but one goose-weight is enough to just submerge it. The final photo shows the goose just before it climbed from the water. 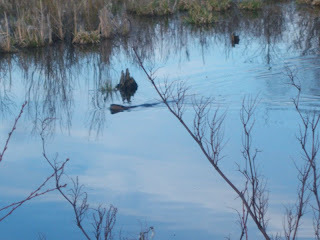 The floating log is near it. 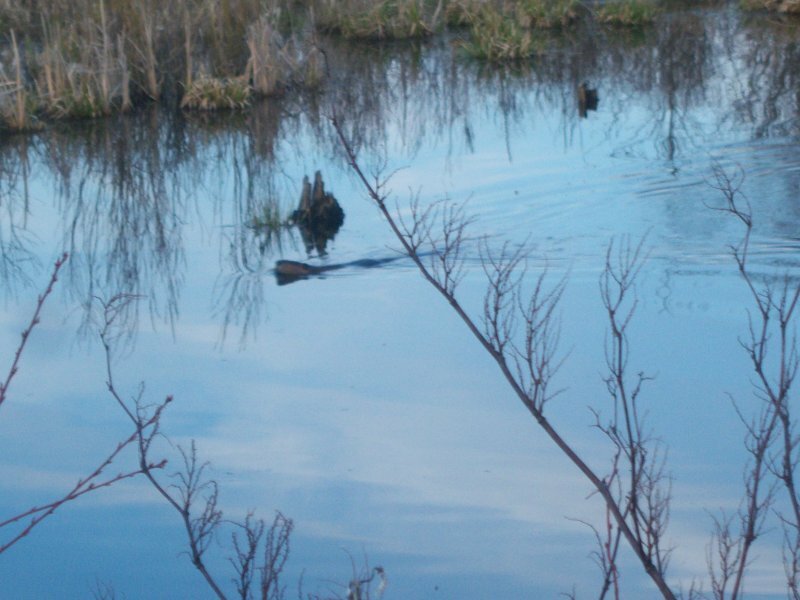 Look closer, and you’ll spot the muskrat in the lower right corner. The first nice days of a young spring with temperatures in the upper 40s and lower 50s have arrived. 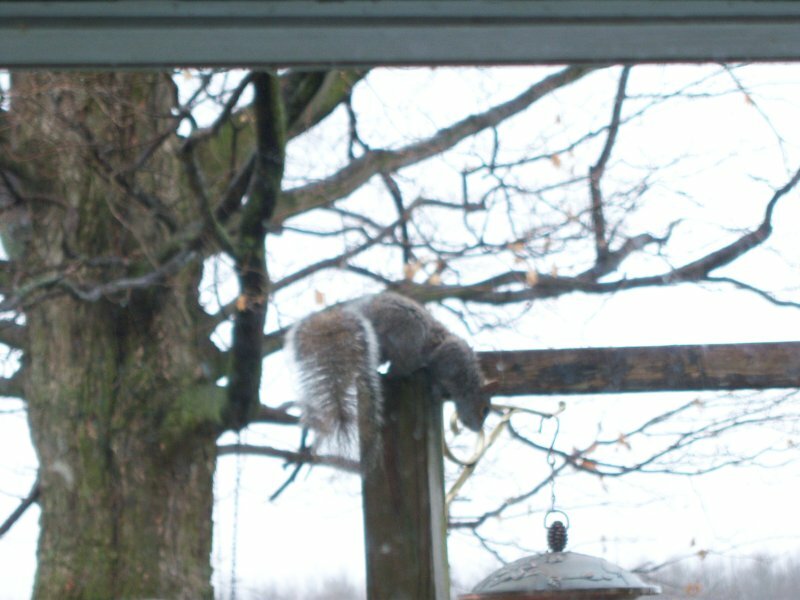 I’m trying to come out of hibernation and enjoy them, but it takes some getting used to. A part of this is using my pickup to do a few small chores, but mostly just to enjoy riding around checking out the scenery. 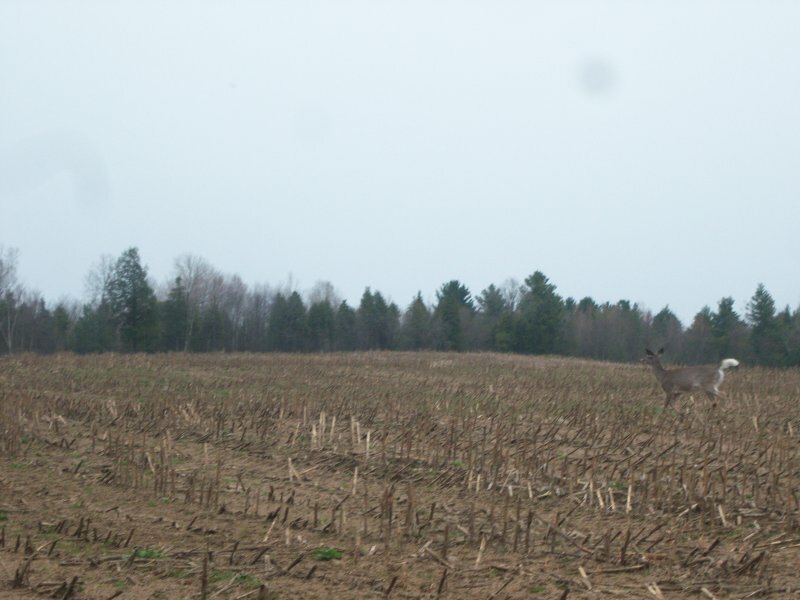 Thursday, April 7th, I was dawdling down a dirt road looking when I spotted a lone deer grazing in a meadow. It was pretty far away for my camera to do justice, but I snapped this anyway. It looked sort of scruffy to me, the result of it being in the process of losing its winter coat of hair, as it acquires its nice new copper colored summer outfit. After returning from that little sojourn I clambered aboard the Bayou Buggy, and headed to the pond to see what the day might have in store at that location. 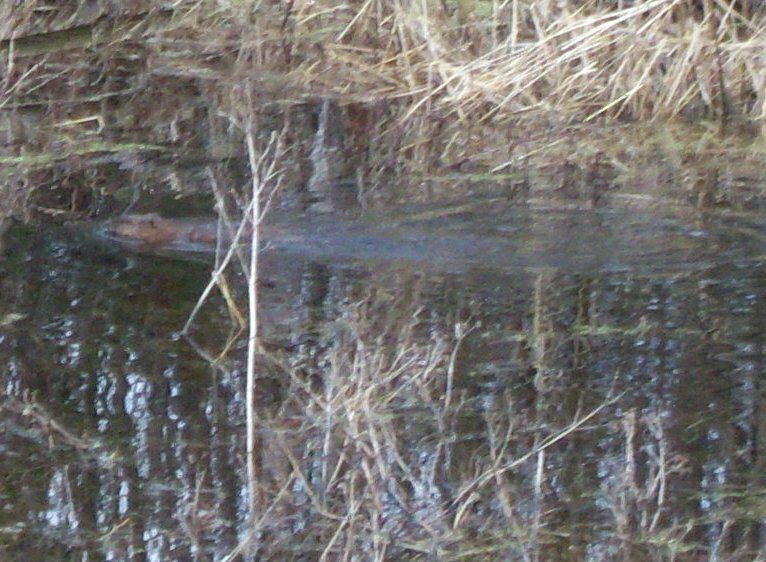 Upon my arrival I spotted this little character swimming about doing whatever it is that muskrats do. It seemed entirely unaware, or unconcerned, of my presence. As the muskrat swam about on the dam side of the farm road, I glanced over to the other side, and a goose had seemingly appeared from nowhere. 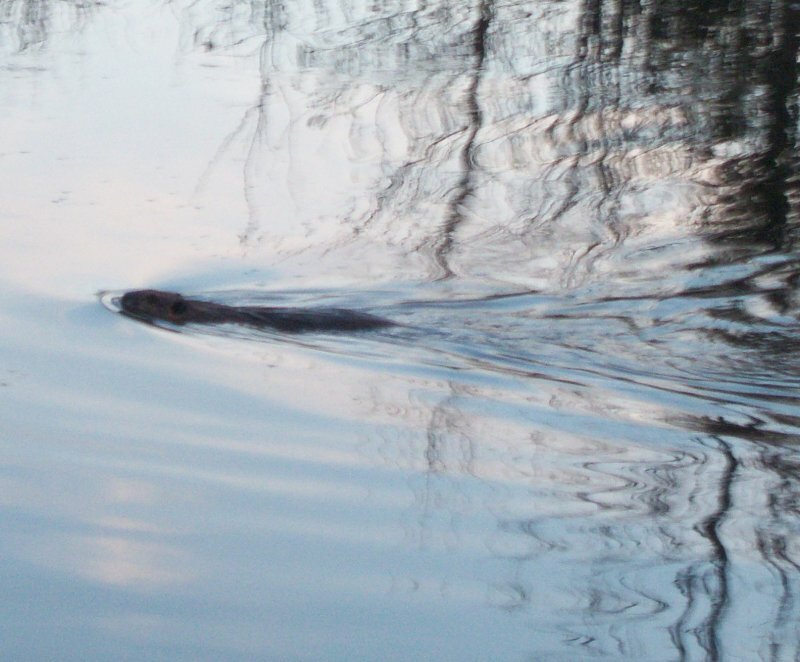 It was slowly swimming about, and quite obviously keeping an eye on me. 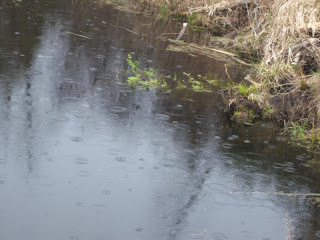 As I quietly snapped photos I noted I could hear frogs announcing themselves after their long winter dug into the pond bottom. 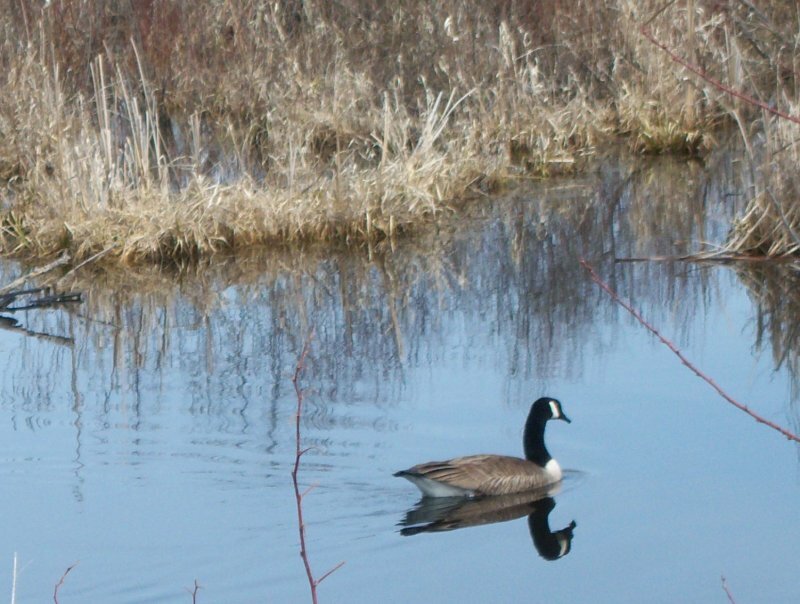 Knowing that a gander will place itself between a possible predator and its mate, I guessed that there may have been another goose nearby. You can note it in among the grasses in the background. That seemed like a full day of my observation of pond life, but this evening I got the urge to return for a dusky look. 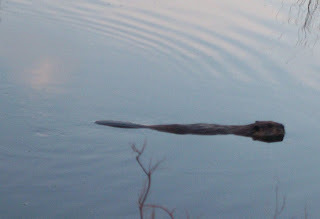 As I arrived I spotted Bucky Beaver lazily swimming on the surface. I reached for my always carried camera to find it missing. After a frantic pocket search I recalled I had put it on the battery charger, and never retrieved it. Back to the house at the breakneck speed of about five miles per hour, grabbed the camera, collected Alex, and off to the pond again. Upon our arrival—nothing. We waited an eternity of approximately 30 minutes, and suddenly, from nowhere, Bucky was leisurely swimming about, as he studied these odd creatures up on the roadway. I snapped photos as fast as possible. Upon downloading back at the computer, I found I had taken 48 photos. Here’s some of them. 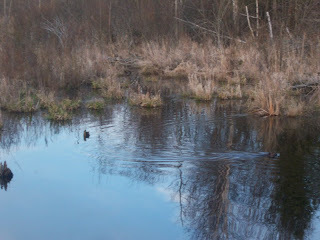 A quick trip to the pond today resulted in very little wildlife sighting, but that is up to the wildlife, not me. 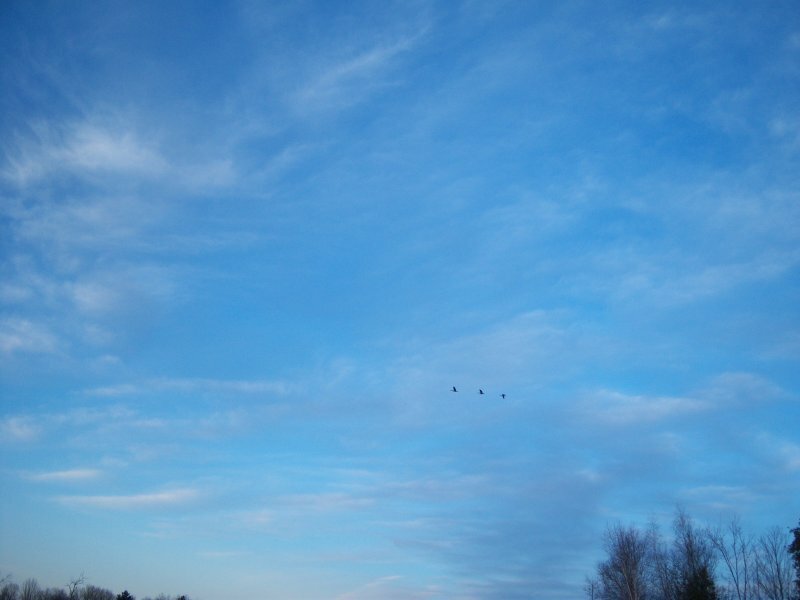 Upon my arrival a pair of ducks rose into the darkening sky with a flourish of wings, water, and much quacking to let me know I was disturbing their afternoon siesta. Things then quieted down a bit so I checked my water gauge to see what the latest level was. 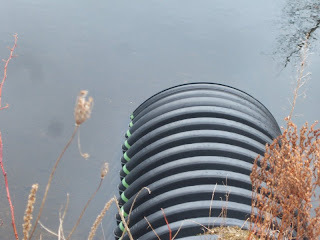 The end of the sluice pipe green line that was 8” above water level a couple of weeks ago is now at water level, so the beaver dam is rising, along with the water level. New sticks and mud can be seen along this length of the dam as well as where the breached part was repaired. Not seen in this view there is additional construction taking place further to the left. 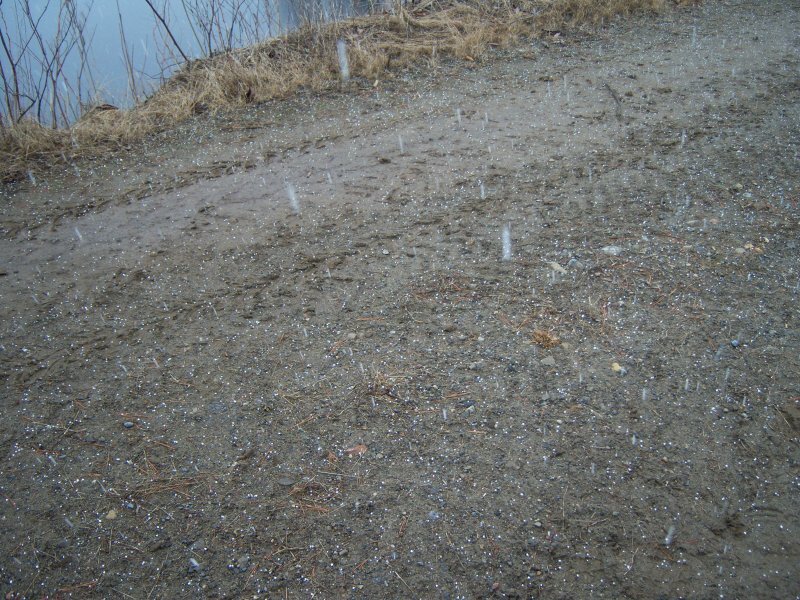 While photographing the pond for your viewing pleasure, suddenly the sky opened up, and of all things, little white B B size balls began to fall. What’s that nonsense about neither rain nor hail shall stay these photographers from their rounds, or something like that? 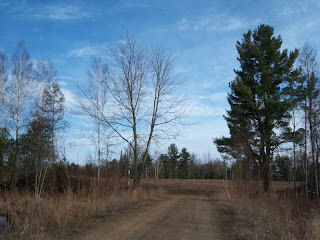 Yet later in the day I went to fill my truck full of gas and also to get a five gallon can full for the ATV. 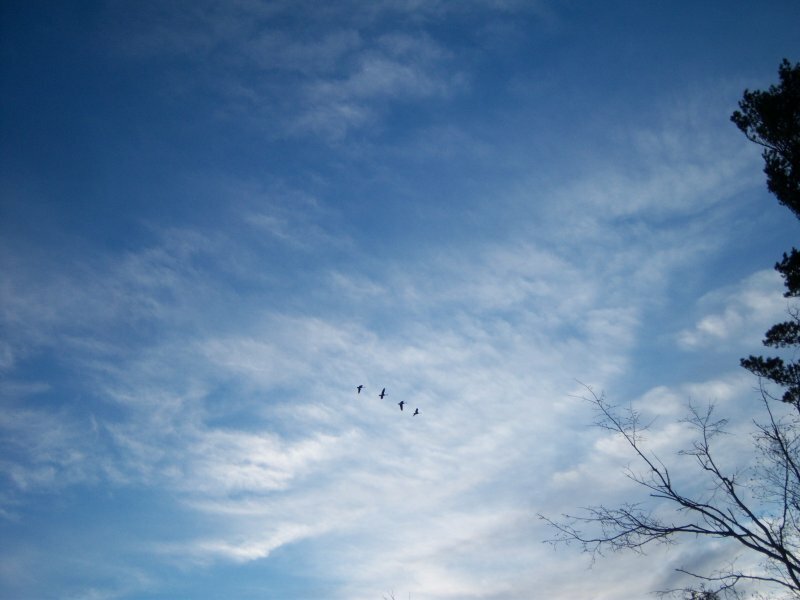 After getting over the shock of $3.959 a gallon gas I was on my way home on Chappel Road when I crossed Sucker Brook and discovered several hundred geese resting there. I had to stop and get a photo of this mass gathering. 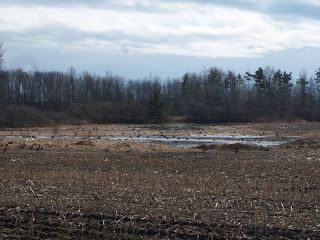 I estimate some 400-500 geese in this photo although lots of them are hard to spot. This last photo is some of the same flock, but taken from a couple of hundred feet further along the road. 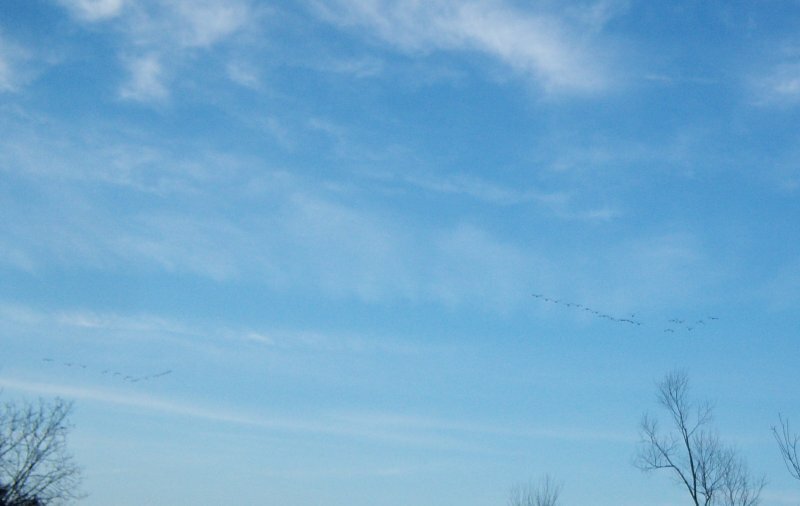 I couldn’t help but note that about 90% were Canadians while the remainder were Snow Geese. Notice how the Snows are flying along as a part of the Canadian flock, yet keep separated to some degree. They are capable of cross-mating, but rarely do.